Your diploma says it, your student loans prove it: You went to college. But be honest: What you really learned had nothing to do with your GPA. Just when you thought it was safe to matriculate, three university grads reveal amazing campus stories of hilarious extracurricular adventures and eccentricities. Ben Applebaum, Ryan McNally, and Derrick Pittman-Web hosts of CollegeStories.com-culled through thousands of tall but true tales of psycho roommates, legendary pranks, hellish hookups, and vertigo nights. The result is this wild collection of the funniest and most bizarre memories from the not-so-hallowed halls of academia. Canty's Obituary Revenge: After his practical-joker buddies place an obituary notice in the local paper, a baffled student returns from a weekend away to a shocked campus and hundreds of condolences. House of the Sinking Feeling: For five Texas undergrads, a class project goes terribly awry, thanks to a combustible mix of rabid armadillos, sporadic gunfire, a sinkhole, and cockroaches the size of cell phones. Indoor Winter Beach Party: In what "seemed like a good idea at the time," snow-weary roommates throw a beach bash in their apartment, replete with swimsuits, kiddie pools, and eight hundred pounds of sand. Hooters and Honors: A young coed/waitress at Hooters earns big tips during a fifty-two-year-old patron's birthday celebration-only to discover later that the "birthday boy" is her new English professor. 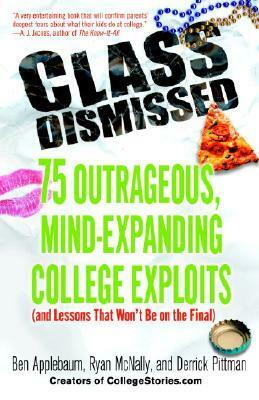 Uproarious and irresistibly candid, "Class Dismissed "should be required reading for students, grads, and only the bravest of parents.